Extraterrestrial life forms invaded virtual space when Frenzoo.com launched the Create an Alien contest in collaboration with Weta. Yes Weta, the very same special effects group that worked on blockbuster hits like Lord of the Rings, The Lovely Bones, and Avatar. The object of the contest is to create an alien out of your Frenzoo 3D avatar and take a snapshot in an atmosphere that is out of this world. The first place winner receives 5 prizes, including two real life gifts--an impressive loot for a virtual contest. 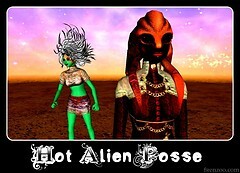 The Create an Alien contest is unique compared to other Frenzoo contests, tangible prizes aside. The winners will not be voted on, eliminating any win-by-popularity chances. If members want to win, their entries need to catch the eyes of two artistic judges: Greg Broadmore from Weta, who designed the steampunk sci-fi world of Dr. Grordbort, and Kogi Ko, the design director for Frenzoo. Hopeful competitors need to stretch their imaginations and work hard to see results. A contest like this inspires any creative individual. Frenzoo creators are already creating alien hair-dos and unearthly designs. Meanwhile, Doctor Who loving, Firefly nostalgic, Star Wars crazed fanatics, such as myself, eagerly await the diversity of items that will undoubtedly sprout in the shop. Not to mention that it is a snapshot contest. Why is that important? Remember just last month, Frenzoo and Koinup became partners. The partnership introduced a feature that allows Frenzoo members to automatically upload their snapshots into Koinup. Will there be an influx of high-quality, alien-tastic Frenzoo works on Koinup in the future?